If You Drop Little Words, You Need This. Like many court reporters, Priscilla Trillo was experienced problems with little words: She would either hesitate, or just not hear them at all, resulting in errors in her transcripts that required later fixing. To counteract this problem, she designed and coded Little Words Machine ... and no longer has problems with little words. Even better, Priscilla has graciously allowed me to host the program here on ol' Cheap and Sleazy. 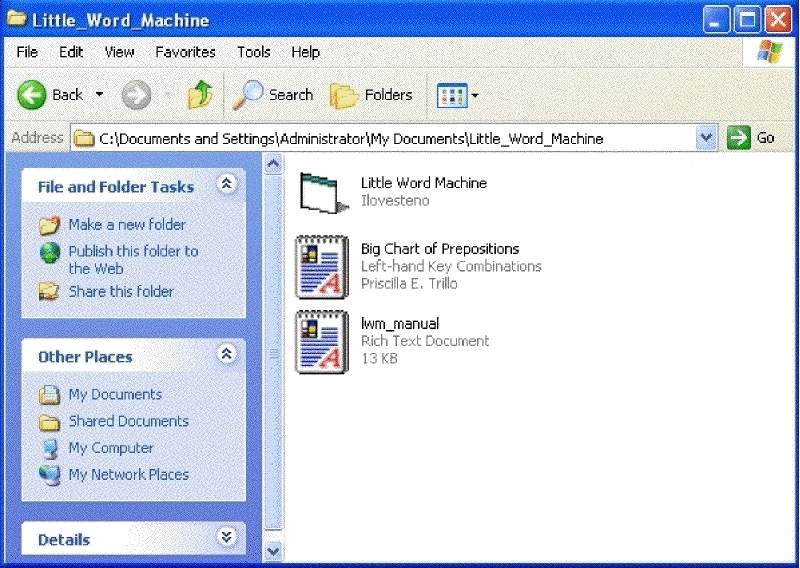 Once you have downloaded, decompressed and opened the Little Words Machine folder, you will find three items: This manual, Little Word Machine.exe, and the Big Chart of Prepositions.rtf. This document is -- more or less -- the manual you will find in the archive. The Big Chart of Prepositions is a file containing the key strokes used in the Little Words Machine. "Maybe they will help you. Some are extremely helpful; others, less so," Priscilla says. "It just gives me the confidence when writing that I can catch up if I need to write out a series of long words and then a bunch of short ones," she continued. First, type in the number of minutes you want to drill in the "Number of Minutes" space. Next, type in the speed you want to drill ... and click the Start button. As you can see, I have selected a one minute drill, at a nice, slow speed of 60 wpm. Note that the WPM speed isn't an exact count of words, but of strokes -- for Priscilla, at least. Also, since the number of words can vary between two and six, if you have "100" in the WPM box, you're probably writing at somewhere near 300 actual words a minute; possibly higher or lower. 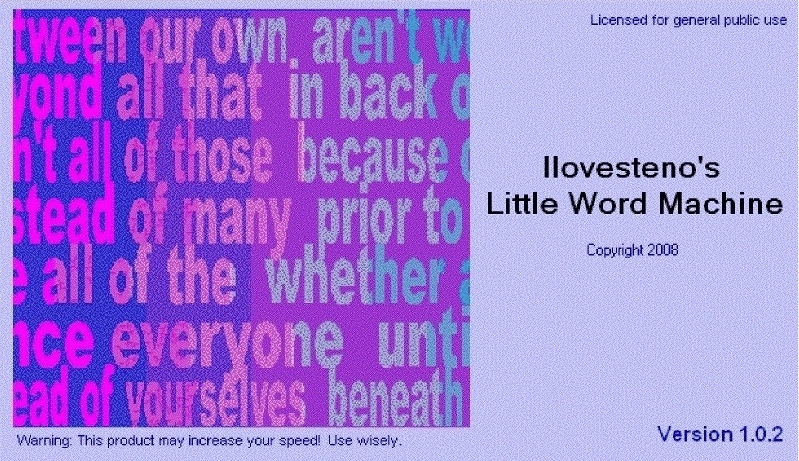 Note that Priscilla has created a one-stroker for most of the word combinations that appear in Little Words Machine (Priscilla's theory started out as Roberts Walsh Gonzales theory, and she has been morphing it since her theory classes) ... and the Big Chart of Prepositions.rtf file is where the steno strokes can be found. Priscilla recommends leaving this unchecked at first, by the way. Priscilla Trillo has worked as an official reporter for the United Nations between 2004 and 2007. She has also taught court reporting school for several years. She wrote the Little Words Machine while taking a forced break due to chemo.